Connor Blain was born almost a week before his due date at the family home in Clackmannan on Monday 10 September. He arrived so fast he was delivered by his father Steven before the ambulance turned up and mother Nicola did not have time to get out of the tub. Nicola, 29, who has two other boys, had gone for a soak after feeling unwell in the morning. She summoned her husband home from work when she realised she was in labour. The 32-year-old called an ambulance but delivered the baby himself before it arrived. The 999 call handler told Steven to get his wife out of the bath but baby Connor was born before she could manage to get out. Mrs Blain said: "It was surreal. I was feeling restless and uncomfortable and I thought I would go for a bath to ease the pain. "I wasn't having contractions or anything. I just felt uncomfortable, but next thing you know at 8.17 his head had popped out. "By 8.25 he was here and I was still lying there in the bath. "There were only three pushes and he was born. It really was unbelievably quick." Ten minutes later, the paramedics arrived to cut the cord and take mother and child to hospital. 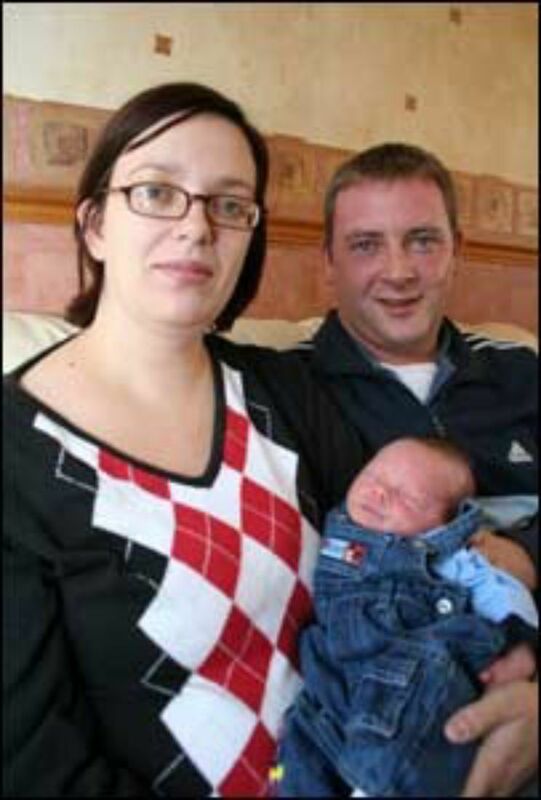 Mrs Blain said that she and her husband had joked about a fast birth but had never expected one this quick. She added: "We thought Connor would be born late because my other two boys were both late, but Connor was five days early. "We had talked about having him in the house but never in a million years did we think it would happen. "At least it was here and not in the back of a car or something like that." Connor weighed in at 7lb 5oz. Mr Blain, a painter and decorator, said: "There wasn't really time for me to react because it happened so fast. "Maybe if I had time to think about it I would have run a mile. "The head came out quickly, and next thing you know his body was out. "The midwives at the hospital were telling me I was stealing their jobs and now the neighbours keep joking and calling me 'doc'. "I can't believe I did it. It still hasn't sunk in yet. It beat waiting around in a hospital anyway."